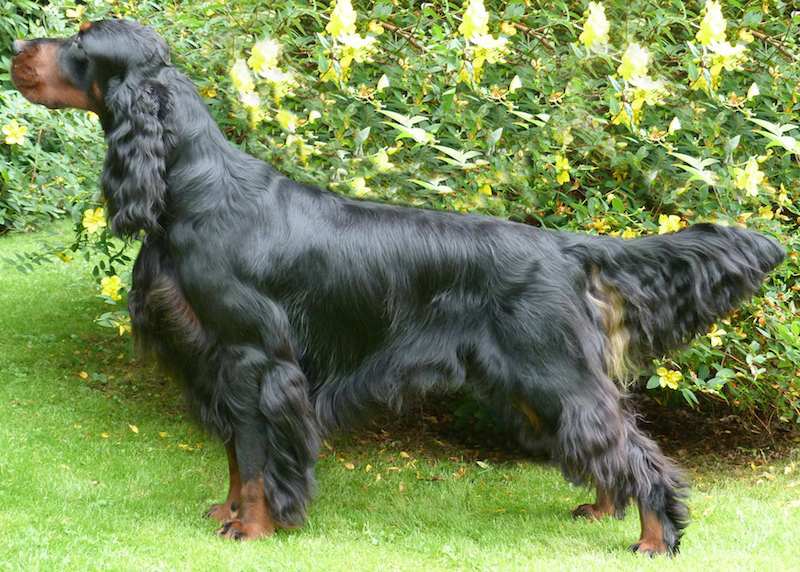 Gordon Setter dog breed was stabilized by Alexander, the fourth Duke of Gordon, between 1770 and 1820. His purpose was to create a larger, heavier setter to adapt to the rugged Scottish countryside. It’s rumoured that some Collie and Bloodhound genes went into the Gordon’s creation. 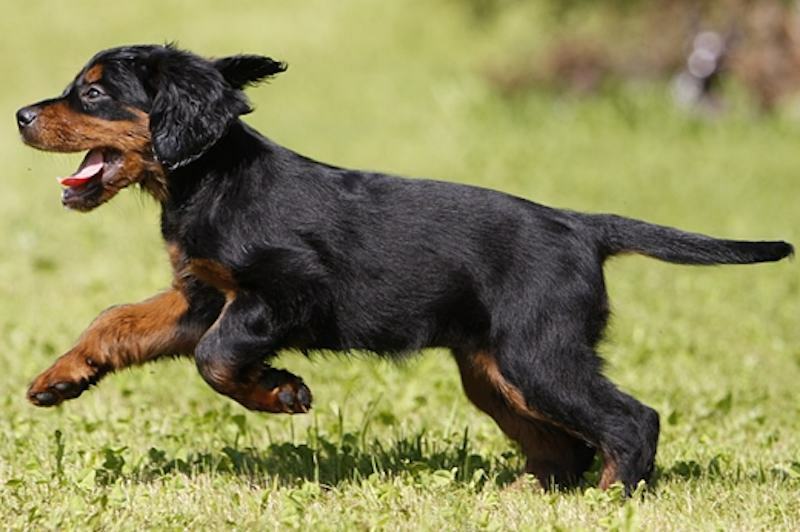 It was a Gordon Setter that won at the world’s first dog show, held in Britain in 1859. However, it should be noted that the competition was limited to Pointers and setters. 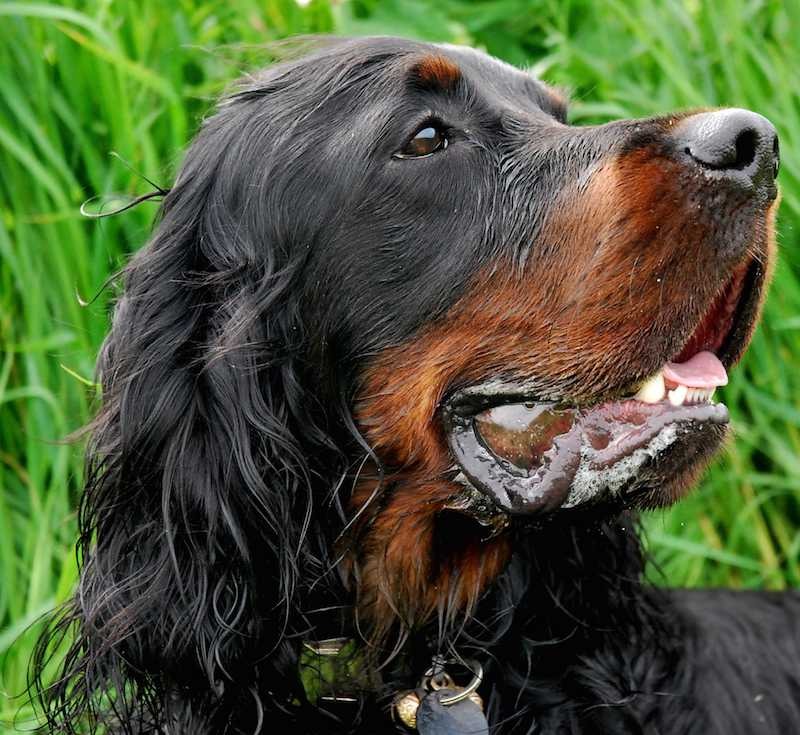 The Gordon Setter was among the first few dog breeds to be officially recognized. 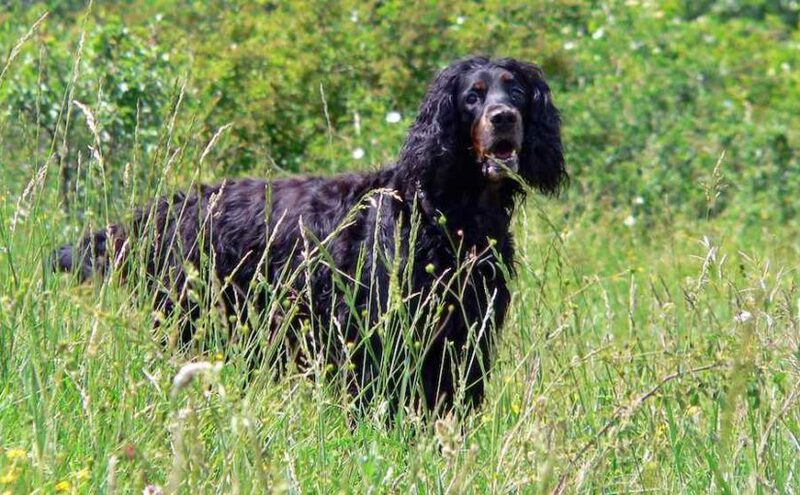 Gordon Setter Temperament: The Gordon Setter delights in the pleasure of being near his owners and is a devoted pet dog. Possessing a keen intellect and retentive memory, he’s mannerly and eager to please in the home. He may be wary of strangers. General Appearance: A good-sized, sturdily built dog, well muscled, with plenty of bone and substance, but active, upstanding and stylish, appearing capable of doing a full day’s work in the field. Strong, rather short back, well-sprung ribs and short tail, a fairly heavy head, finely chiseled, intelligent, noble and dignified expression, showing no signs of shyness; clear colours and straight of slightly waved coat. A dog that suggests strength and stamina rather than extreme speed. Symmetry and quality are most essential. A dog well balanced in all points is preferable to one with outstanding good qualities and defects. Size: Shoulder height for males, 24-27 inches (61-69 cm); for females, 23-26 inches (58-66 cm). Weight: Males, 55-75 lb. (25-34 kg); Females, 45-65 lb. (20-29 kg). As a guide, the greater heights and weights are to be preferred provided that character and quality are also combined. Dogs over and under these heights and weights are to be discouraged. Coat and Colour: Coat should be soft and shining, resembling silk, straight or slightly waved – the latter preferred – but not curly, with long hair on ears, under stomach, on chest, and on back of the fore and hind legs to the feet. Deep, shining coal-black with tan markings, either of rich chestnut or mahogany red colour. The tan should be shining and not dull, yellowish or straw colour and not mixed with black hairs. Black penciling allowed on toes. The borderlines between black and tan colours should be clearly defined. There should not be any tan colours mixed in the black. Tan markings: (a) Two clear spots over the eyes not over 3/4 inch (2 cm) in diameter. (b) On the sides of the muzzle, the tan should not reach above the base of nose, resembling a stripe around the end of the muzzle from one side to the other. (c) On the throat. (d) Two large, clear spots on chest. (e) On the inside of the hind legs and inside of thighs showing down the front of the stifle and broadening out to the outside of the hind legs from the hock to the toes. It must, however, not completely eliminate the black on the back of hind legs. (f) On the forelegs from the knees or a little above downward to the toes. (g) Around the vent. A white spot on the chest is allowed, but the smaller the better. Head: Deep rather than broad, with plenty of brain room, nicely rounded good-sized skull, broadest between the ears. The head should have a clearly indicated stop. Below and above the eyes should be lean and the cheek as narrow as the leanness of the head allows. The muzzle fairly long with almost parallel lines and not pointed either as seen from above or from the side. The flews not pendulous but with clearly indicated lips. The nose big, broad with open nostrils and of black colour. Eyes of fair size, neither too deep set nor too bulging, dark brown, bright and wise. Ears set low on the head, fairly large and thin. Neck: Long, lean, arched to the head and without throatiness. Forequarters: Shoulders should be fine at the points, deep and sloping well back, giving a moderately sloping topline. Forelegs big-boned, straight, not bowed either in or out, with elbows free, well let down and not inclined either in or out. Body: Chest deep and not too broad in front; the ribs well sprung, leaving plenty of lung room. Hindquarters: The hind legs from hip to hock should be long, flat, and muscular, from hock to heel short and strong. The stifle and hock joints well bent, and not inclined either in or out. Both fore and hind feet should have close knit, well-arched toes with plenty of hair between with full toe pads and deep heel cushions. Tail: Short and should not reach below the hocks, carried horizontal or nearly so, thick at the root and finishing in a fine point. The feather, which starts near the root of the tail, should be slightly waved or straight and have a three-square appearance growing shorter uniformly toward the end. Gait: A smooth free movement with high head carriage. Faults: 1. General Impression – Unintelligent appearance. The Bloodhound type with heavy and big head and ears and clumsy body, as well as the Collie type with its pointed muzzle and curved tail, or showing any signs of shyness. 2. Head – Houndy, pointed, snipey, drooping or upturned muzzle, too small or large mouth. 3. Eyes – Too light in colour, too deep-set, or too prominent. 4. Ears – Set too high or unusually broad or heavy. 5. Neck – Thick and short. 6. Shoulders and Back – Irregularly formed. 7. Chest – Too broad. 8. Legs and Feet – Crooked legs. Out-turned elbows. The toes scattered, flat-footed. 9. Tail – Too long, badly carried or hooked at the end. 10. Coat – Curly like wool, not shining. 11. Colour – Yellow or straw coloured tan or without clearly defined lines between the different colours. White feet. Too much white on the chest. In the black there must be no tan hairs which can appear often around the eyes.